When I was fourteen, I began thinking up ideas for a fantasy story. I started creating and developing characters, thinking of scenes, and imagining plot twists. Soon enough I started daydreaming about all of it as a movie, and that’s when I realized that I didn’t want to write a simple fantasy short story, I wanted to write a novel. So I got to work and started writing chapter one. I thought everything was awesome—my characters were great, my setting was great, my plot was great—everything was great. I would be writing and developing the story constantly in my head, but physically I wrote little bit on and off for about a year. Then I took a creative writing class in high school, and—uh oh. I had a new book idea. I just had to write it. At the time, it was no big deal. I simply put my fantasy ideas to the side so I could focus on my new book. If it didn’t end up working, I’d have another story to fall back on. But it did work, and six months later I finished my very first novel, Unperfected. And when I did, I decided to press on to the second book while working on the developing the fantasy book on the side. My original fantasy story word document is dated a little over four years ago, and when I first reread it, I wanted to hide. It was so bad. The first paragraph of the story that I spent so much work on perfecting is actually very boring and doesn't pull me into the story at all. The characters are flat and very, very different from the current characters for this book residing in my head—the ones I developed and personalized as I wrote Unperfected. The setting is lame, the dialogue is cheesy, and there is an attack siren on top of the castle. No, not a bell. An attack siren. On a castle. And on top of all of that, the plot that I thought was so original and great is actually very cliche and unoriginal. So now I currently have a head full of well-developed characters, creative names for kingdoms, and classifications of different magics, but hardly any plot. Yay. Taking a break from writing can be a very good thing. Sometimes when you're writing, you can burn out. Maybe you've had a good streak of writing every day for a few weeks, or maybe you wrote over two chapters in one hour. Whatever it is, you've been writing and working on your project and now you feel stumped. You might get stuck on a chapter, or maybe in the middle of the sentence. No matter how hard you try to make yourself, you can't keep going. It's times like these where it's more than okay to take a break--it's a good thing. A break gives your creative mind time to recharge and think about something other than your writing. Go outside, do something fun, watch a movie--just take a break. Or if you need something more extensive, close the document and don't open it for a few days. When you give yourself a break, coming back to your writing is like looking at it through a different pair of eyes. Mistakes pop out, dialogue sounds fresh, and you can also tell if your words are actually flowing or not. It's not always easy to take a break from writing. In fact, a lot of the time I feel guilty for it. But sometimes breaks are necessary. Now, I'm not saying that when you get stuck in a story you should put it away for three years. But if you feel like you need a break, then take one. There's no need for you to feel guilty for it. Take this post for example! I started writing this post last week, and it just didn't feel like it was working. So I saved it and focused my attention on the other things I needed to get done. I ended up not having time to post anything at all last week. Now that I've taken a break, I was able to re-read this post with fresh eyes and a clear head, and I realized it's not as bad as I thought it was. 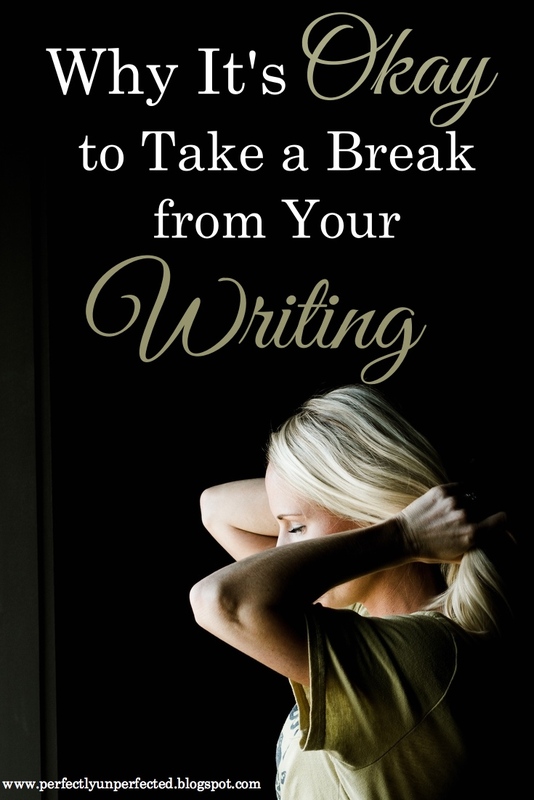 Sometimes you may not want to take a break from your writing, but other times it might be truly necessary. When you've been writing for a while and the words start to blur or your writing starts to sound bad, put the notebook down or close the document. Who knows--maybe a break will stop you from making the mistake of trashing an idea, or maybe it will help you see that whatever you're working on just isn't really working and isn't worth your time. Either way, sometimes taking a few days off after you've been writing hard will help more than you think.